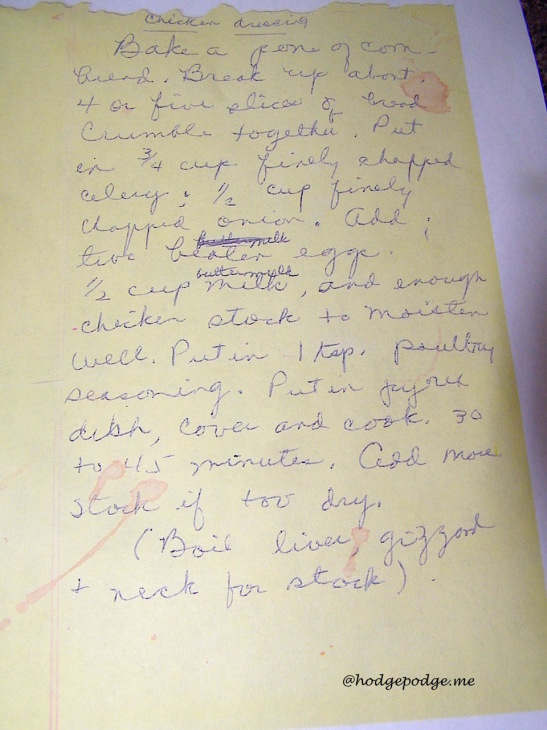 This is my maternal grandmother’s recipe for Thanksgiving dressing. Nana has the recipe that Mamaw wrote down herself. The recipe begins with “bake a pone of cornbread.” I never wondered about the definition of a pone until I began typing this recipe. I think of a pone as just a nice, round hunk of cornbread that comes out of that black, iron skillet you cook it in. “Don’t put in too much poultry seasoning in or people will think you are a yankee, as it will be ‘too sage-y’. Taste it, it won’t kill you just because it is not cooked yet – you have to get it to taste right. Be sure there is enough stock on it or it will dry out. Make it soupy. Yes, Mamaw. It is amazing how much a directly quoted recipe says about a person. And she sure could bake a delicious pone of cornbread. I have fond memories of veggie plates in the summer time served at her and my grandfather’s house, pictured above. And to accompany the dressing, here are the turkey guidelines. I always have to have specifics about turkey parts. Add a stick of butter to anything and you can call it a Southern recipe. 1. Look in both ends of the turkey and take out the neck, gizzard, heart, etc. 3. Add enough flour to make a sort of paste. Add enough until when you stick your finger in the middle the paste doesn’t stick. 4. Apply to turkey with your hands, covering the entire bird. Pay special attention and add just a little more to breast area and tips of legs, as these dry out. 5. Follow directions on turkey packaging for oven temperature and cooking time by the pound of turkey. This makes a moist, flavorful turkey every time! Our allergy-friendly and practical Thanksgiving Menu is here. 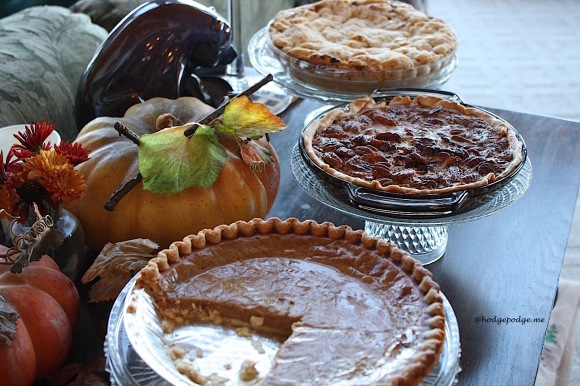 Then be sure to enjoy plenty of pie! Thank you for this….made me get a bit misty-eyed…I miss my Mama especially around the holidays! Thank you. I’ve been searching for a dressing recipe like my family has always made. 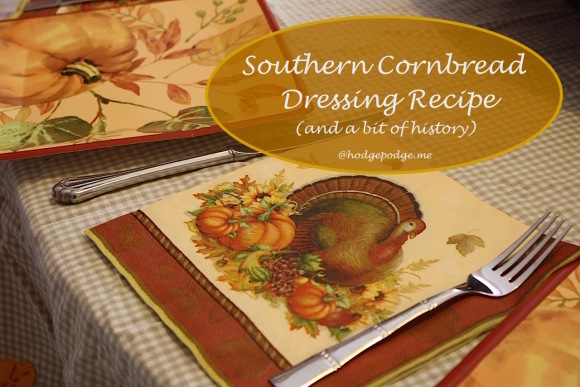 When I was little, my great grandmother & grandmother always made the dressing. It was done by the time we got to their house. So I never got to learn how to make it. I was going to learn from my mother, but she passed away unexpectedly. So I’m learning on my own. I started by looking at images on Google and saw your grandmother’s written recipe. It looked like the right handwriting. And when it started with a pone of cornbread, I knew it would be right. Only thing missing was to add Oleo at some point. Thank you. 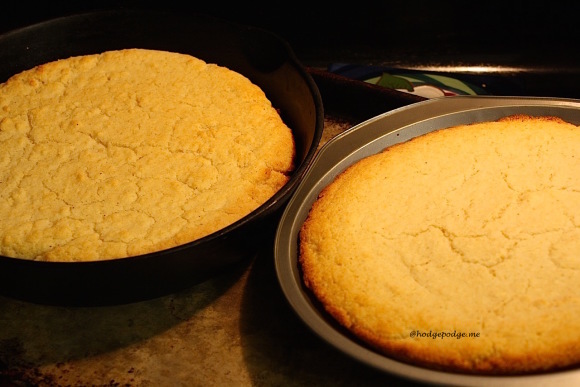 Oh I am happy this helped – yes, a pone of cornbread! Happy Thanksgiving!